1.� 01:355:101 Expository Writing or its equivalent. Students with a grade of 4 or 5�on the Advanced Placement Test are awarded degree credit for 01:355:101. With the exception of transfer students, all students must take this course at Rutgers-New Brunswick/Piscataway. 2.� An additional course, beyond 01:355:101 Expository Writing, selected from a list approved by the Rutgers College curriculum committee and distributed to first-year and transfer students and posted on the Rutgers College web site. With the exception of courses equivalent to 01:355:102 or 201 taken prior to matriculation at Rutgers University, the second writing course must be taken at Rutgers-New Brunswick/Piscataway. In addition to 01:355:101 Expository Writing, 01:355: 098 Composition Skills and 01:355:100 Basic Composition are graduation requirements for students who, in the judgment of the Department of English, show need for additional work in composition. Beginning with the writing course identified by the Department of English, students must register for and complete composition courses in consecutive terms, with no hiatus, until they have passed 01:355:101 Expository Writing. Students who fail either 01:355:100 or 01:355:101 two times may register only for English 100 or 101 until they successfully complete the course. English 01:355:098, 100, and 101 do not fulfill any other general education, major, or minor requirements. The list of courses fulfilling the quantitative skills requirements can be obtained from the Office of Academic Services and is posted on the college web site. Students whose math placement test shows that they need to complete remedial math courses (01:640:025 or 026) must begin remediation in their first term at the college and must register for and complete remedial courses in consecutive terms, with no hiatus, until they have passed 01:640:026 Intermediate Algebra or 01:640:027 Elements of Algebra. Courses taken in satisfaction of the quantitative skills requirement may be used to fulfill major or minor requirements. Two courses of at least 3 credits each, in the same subject, chosen from: life sciences (115, 119, 146, 447, 694), chemistry (160), ecology and natural resources (704), environmental science (375), geological sciences (460), meteorology (670), microbiology (680), or physics (750).�Independent study, internships, and research courses may not be used to fulfill this requirement. Two courses of at least 3 credits each, in the same subject, chosen from: anthropology, economics, geography, history, political science, psychology, or sociology. Independent study, internships, and research courses may not be used to fulfill this requirement. Two courses of at least 3 credits each, in the same subject, chosen from: African languages and literatures, Armenian, art history, Chinese, classics, comparative literature, English, French, German, Greek, Hebrew, Hindi, Hungarian, Italian, Japanese, Korean, Latin, linguistics, music, philosophy, Polish, Portuguese, religion, Slavic languages and literatures, or Spanish. Independent study, internships, and research courses may not be used to fulfill this requirement. One course of at least 3 credits focusing on the non-Western world selected from a list approved by the Rutgers College curriculum committee and distributed to all first-year and transfer students and posted on the college web site. This course also may be used in partial satisfaction of requirements A, C, D, or E above. Courses taken in satisfaction of requirements B, C, D, E, and F above also may be used to fulfill major and minor requirements. 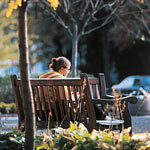 * The following interdisciplinary departments offer courses that may fulfill eitherthe humanities or social sciences requirement, provided the courses are not cross-listed: African studies; American studies; European studies; Jewish studies; Puerto Rican and Hispanic Caribbean srudies, and women's and gender studies. If a course is cross-listed with another department, the course counts in the area of the cross-listed department. Students may not use four courses from thhe same interdisciplinary department to fulfill both the humanities and social science requirements.